Glaucoma is a group of diseases that can damage the eye's optic nerve and result in vision loss and blindness. The exact location of the disease damage is in the retinal nerve fiber layer, one of the ten layers of the retina. There is a characteristic acquired loss and/or degradation of retinal ganglion cells (retinal nerve fiber layer). The optic nerve is a bundle of more than 1 million nerve fibers. It connects the retina to the brain. A healthy optic nerve is necessary for good vision. Glaucoma is a multifactorial, progressive, neurodegenerative disorder. Glaucoma is characterized by the death of retina ganglion cells, optic nerve atrophy and loss of neurons in the brain (lateral geniculate nucleus and the visual cortex). In primary open-angle glaucoma, intraocular pressure (IOP) is the biggest risk factor for glaucoma onset and progression and is the only risk factor glaucoma specialists can modify. However, neurological factors contribute to glaucoma's onset and progression that unfortunately cannot be modified. There is ongoing research to develop treatment to minimize the neurological damage for glaucoma patients. Approximately three million Americans have glaucoma. However, almost half of these people are unaware that they have the disease. 800,000 Americans are legally blind from glaucoma. Glaucoma causes a loss of some of the nerve fiber layer in the retina of the eye. There is no cure for glaucoma. In most cases, glaucoma can however be treated with medicine (eye drops) to prevent or reduce further vision loss. Once vision is lost it cannot be recovered. Therefore, it is imperative to prevent loss by diagnosing and treating glaucoma early. Sometimes, when the fluid reaches the angle, it passes too slowly through the meshwork drain. As the fluid builds up, the pressure inside the eye rises to a level that may damage the optic nerve. When the optic nerve is damaged from increased pressure, open-angle glaucoma and vision loss may result. That's why controlling pressure inside the eye is important. However, increased eye pressure does not mean you have the disease, but it does mean you are at risk for glaucoma. A person has glaucoma only if the optic nerve or retinal nerve tissue is damaged. Not every person with increased eye pressure will develop glaucoma. Some eyes can tolerate higher internal eye pressure better than others. Whether you develop glaucoma depends on the level of pressure your optic nerve can tolerate without being damaged. This level is different for each person. That's why a comprehensive dilated eye exam and especially a Spectral Domain OCT scan (optical coherence tomography) test is very important. In contrast, glaucoma can develop without increased eye pressure. This form of glaucoma is called low-tension or normal-tension glaucoma. At first, open-angle glaucoma has no symptoms. It causes no pain and vision stays normal. As glaucoma remains untreated, people may miss objects to the side and out of the corner of their eye. Without treatment, people with glaucoma will slowly lose their peripheral (side) vision and some areas within the central visual field. Over time, straight-ahead vision and peripheral vision may decrease until no vision remains. THERE ARE NONE! In the most common form of glaucoma there are no signs and symptoms obvious to the patient until very late stages of the disease. It is then too late! Have your eyes examined every year by a glaucoma specialist or eye doctor! Optical Coherence Tomography (OCT Scan) Can Diagnose Glaucoma Before All Other Tests. It is arguably the most accurate test in the world to assist our doctors in diagnosing glaucoma. GDxVCC Scanning Laser Polarimetry: This is also one of the world’s most accurate single tests in diagnosing glaucoma. Along with the OCT scan, this is the only type of technology available that directly and objectively evaluates the retinal nerve fiber layer of the eye, which is the specific site of damage from glaucoma. 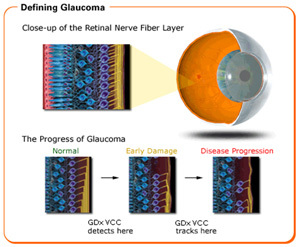 OCT and GDxVCC can detect nerve fiber layer loss approximately six years before visual field loss. Scanning Laser Polarimetry or an OCT scan is a must in diagnosing and monitoring glaucoma. 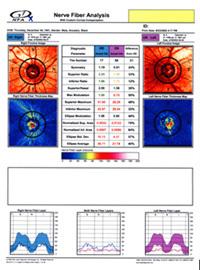 The newest spectral domain OCT used by Master Eye Associates' optometric glaucoma specialists provides even better diagnostic capabilities than the GDx or the Stratus OCT because our new OCT can monitor progression of retinal nerve fiber loss over time. Only the newest spectral domain OCT can monitor progressive loss of the nerve fiber layer. That function is crucial in monitoring glaucoma, which by its very nature is a disease of progression. At Master Eye Associates we believe that having the best technology is a way of showing that we care about our patients. Visual field test. This test measures your central and peripheral vision area. It helps tell if you have reduced visual sensitivity to certain areas within your visual field as well as lost visual field areas called scotomas. Although this test is useful and still the most used test in diagnosing glaucoma it is not as accurate in diagnosing early glaucoma as the GDxVCC. Unfortunately, up to 60 percent of nerve fibers may be diminished or damaged before visual field analysis can identify a problem. Remember, the OCT scan or our GDxVCC threshold exam can identify glaucoma up to six years before the problem is identified on the visual field test. Tonometry. An instrument called a tonometer measures the pressure inside the eye. There are several different methods to test the fluid pressure inside the eyes. The newest tonometer takes into account the many biomechanical properties of the cornea that influence intraocular pressure. Pachymetry. A numbing drop is applied to your eye. Your eye care professional uses an ultrasonic wave instrument to measure the thickness of your cornea. It is now well documented by a major national study (Ocular Hypertension and Treatment Study OHTS) that thinner than average corneas are a definite risk factor for glaucoma. This test can also be performed using optical coherence tomography instead of ultrasound. At this time there is no cure for glaucoma. Vision lost from the disease cannot be restored. That is why immediate treatment for early stage, open-angle glaucoma is so important. Immediate treatment can delay progression of the disease. Glaucoma treatments include eye drop medicines, laser trabeculoplasty, conventional surgery, or a combination of any of these. While these treatments may save remaining vision, they do not improve sight already lost from glaucoma. Glaucoma is a progressive disease and much of the treatment is based on the rate of progression of the disease. Unfortunately, no matter how well the disease is treated, no matter how good the glaucoma specialist, no matter how good the medicine, glaucoma usually gets worse. The goal is to maintain functional vision for the patient's lifetime. Medicines, in the form of eye drops or pills, are the most common early treatment for glaucoma. Some medicines cause the eye to make less fluid. Others lower pressure by helping fluid drain from the eye. Glaucoma medicines are often instilled several times a day. Because glaucoma has no symptoms, people may be tempted to stop taking, or may forget to take, their medicine. You need to use the drops or pills as long as they help control your eye pressure. Regular use is very important. Make sure your eye care professional shows you how to put the drops into your eye. Most people have no problems. However, some medicines can cause headaches or other side effects. For example, drops may cause stinging, burning, and redness in the eyes. If you have problems with one medicine, tell your eye care professional. Treatment with a different dose or a new drug may be possible. It is also important that you tell your eye care professional about other medicines you may be taking before you begin glaucoma treatment. Sometimes the drops can interfere with the way other medicines work. Click for a list of currently used glaucoma medicines and their side effects and benefits. In low-tension or normal-tension glaucoma, optic nerve damage and narrowed side vision occur in people with normal eye pressure. Lowering eye pressure at least 30 percent through medicines slows the disease in some people. Glaucoma may worsen in others despite low pressures. A comprehensive medical history by a glaucoma specialist is important in identifying other potential risk factors, such as low blood pressure, that may contribute to low-tension glaucoma especially while sleeping. If no risk factors are identified, the treatment options for low-tension glaucoma are the same as for open-angle glaucoma. You also can help protect the vision of family members and friends who may be at high risk for glaucoma--African Americans over age 40; everyone over age 60, especially Hispanic Americans; and people with a family history of the disease. Encourage them to have a comprehensive dilated eye exam at least once every two years. Lowering eye pressure in glaucoma's early stages slows progression of the disease and helps save vision.